I have to admit that when I first came across this I was a bit dubious. Seitan (wheat gluten) is high in protein and often referred to as “wheat-meat” due to its similarity in texture to meat. This is a bit of work but you can cheat by purchasing store-bought seitan. I rarely ever advocate purchasing packaged food but a good brand of store bought seitan, such as Upton’s Naturals, saves a ton of time as making seitan from scratch requires its own blog post and several spare hours. Place a few spoonfuls of mustard in a small bowl. In a separate larger bowl, put several tablespoons of cornmeal and ground black pepper. Slice the seitan into about 1/2 inch thick pieces. This can be difficult since it comes in funny shapes so do your best and don’t sweat it. 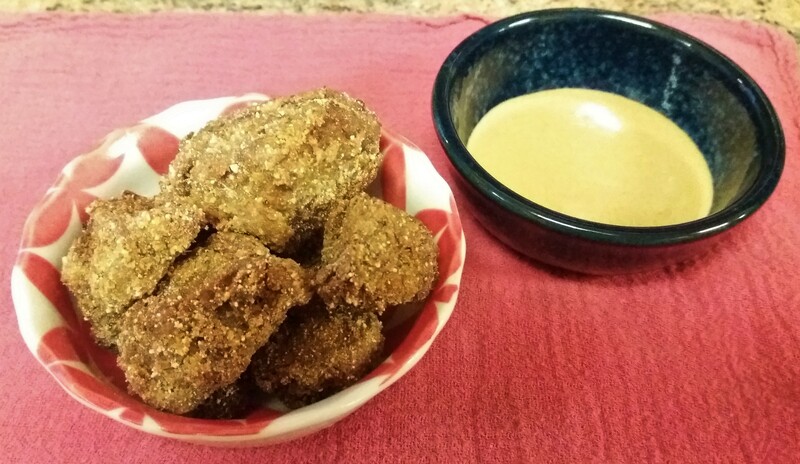 Using your finger, spread a thin layer of mustard on a piece of seitan and then dip it in the cornmeal ensuring it gets fully coated. Place on a plate. Finish coating all the seitan and set aside. In a cast iron pan (can use stainless steel skillet as well), heat a few tablespoons of oil and bring to a low frying temperature. The oil should never smoke. It will be hot enough when it sizzles slightly when you add the seitan. Add the seitan to the pan ensuring there is space between each piece. Fry until light brown on both sides and then place on a unbleached paper towel to drain. These seitan crisps can be placed in a tortilla with lettuce and avocado or dipped in a tahini sauce.